In the world of fiction, there are many writers out there. And as there are many writers there are just as many different types of genres. One of these genres is the fantasy genre. It is an area of fiction that several authors can write well and some that I’m afraid to say cannot. Luckily I’ve had the pleasure of reading some good writers. And, unfortunately I’ve had the displeasure to have read some bad ones. Now, one that stands out has an uncanny grasp of the written word is D.P. Prior who is one of the good writers out there. D.P. Prior is the author of the Nameless Dwarf series. And, he is one of the authors that can indeed write the fantasy genre very well. The type of fiction that the fantasy genre represents is filled with magic, creatures of mythic lore, and lands of immense description and imagery that can Make you weep in your mind’s eye. I myself don’t like to spoil things for people. You see, ff someone spoils it for me I don’t really mind. But doing it to others I think is in bad taste. So no, I will not be giving out plot points to the story so don’t ask. What I’m going to do is my best on letting you know how well this book was written and how well the story flows with it’s rich characters, as well as it’s vivid landscapes. I also will do my best to explain to you how well written the battle scenes are done, giving you an explosive example of how fighting by dwarves is and should be done. His way of creating worlds and characters is something that has made me look at fantasy writing in a different way. Prior has a way of creating battle scenes that make it look easy, something that not many can do. His way of writing makes you want to keep turning the page to see what comes next. Action scenes that come out from the page with their vivid detail and imagery give you the feeling of being there during the action. 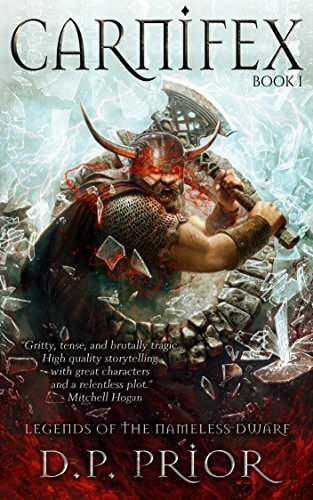 All in all, his writing is something that I would recommend to anyone who is interested in the fantasy genre and I can state that they would not be disappointed with his style of story telling. I believe that if and when you decide to pick up his latest tome titled “Carnifex,” that you will enjoy it as much as I did.